The "war on terror" led by the US is behind a surge of human rights abuses around the world, according to a report by Amnesty International. The organisation said America's assault against global terrorism had "made the world a more dangerous place". It said reactions to the 11 September 2001 attacks on the US still dominated the way human rights were dealt with. US officials said they took Amnesty's report "seriously", but said America was a "leader" in human rights. You put your questions to Amnesty International Secretary General Irene Khan in an interactive forum. Amnesty also criticised other countries for their treatment of terror suspects. Amnesty's Secretary General Irene Khan said the US pursuit of security had actually made the world a more dangerous place. "Sacrificing human rights in the name of security at home, turning a blind eye to abuses abroad and using pre-emptive military force where and when it chooses, have neither increased security nor ensured liberty," she said. The report cites the hundreds of detainees from around 40 countries who are being held by the US without charge in Iraq, Cuba and Afghanistan. It has refused to grant prisoner-of-war status to more than 600 detainees at the US base in Guantanamo Bay, Cuba, choosing to describe them as "illegal combatants". The world should have expected the shocking photographs of Iraqi prisoners being tortured at Abu Ghraib prison in Iraq, Ms Khan said. "This is the logical consequence of the relentless pursuit of the war on terror since 11 September. It is the result of the US seeking to put itself outside the ambit of judicial scrutiny. "The US has lost its high moral ground and its ability to lead on peace and elsewhere," she said. White House spokesman Scott McClellan dismissed the report, saying: "The war on terror has led to the liberation of some 50 million people in [Afghanistan and Iraq], and the United States is a leader when it comes to protecting human rights, and we will continue to be." But US State Department spokesman Richard Boucher said: "We do take Amnesty's report seriously. We look at what they say... We have close ties. We talk to them all the time, share information." "That being said, we don't necessarily agree with their views. 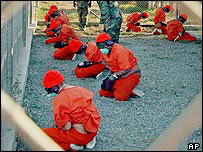 We have recognized the abuses that took place at Abu Ghraib... Justice is being served and will be served in that matter." Amnesty said coalition forces failed to live up to their obligations as the occupying power during the war on Iraq and that civilians had died as a direct consequence of the excessive force used by soldiers. The war in Iraq, the report said, has diverted global attention from other human rights abuses around the world. The year 2003 had also dealt a blow to the UN's vision of universal human rights, with the global body "virtually paralysed in its efforts to hold states to account", the report said. "The war on terror has given a new lease to old-fashioned repression"